The banquet is over, the table has been cleared, and Salome enters bearing her promised reward on a platter. With a deep curtsey she holds it out before Herod. In earlier representations the princess is something of an acrobat, and here she bends back so far that without the strong vertical of her white veil she would seem in danger of falling. Herod and an elegant young man look down at the head whereas the other courtiers watch intently for the Queen’s reaction. Herodias, who plotted the death, leans away and calmly, without looking down, plunges a knife in the John’s forehead. Herod, beneath his scarlet canopy, half rises and raises a hand in horror. The Golden Legend does not describe this deed, which was little known and perhaps represented here for the first time. Jerome records it, but Jean de Berry and his entourage had almost certainly seen visual evidence — of a kind. 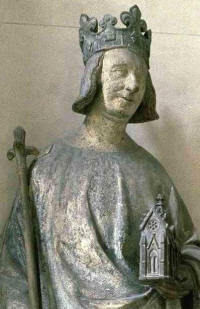 During the Fourth Crusade the supposed head of St. John was brought from Constantinople and placed in a chapel in the cathedral of Amiens. 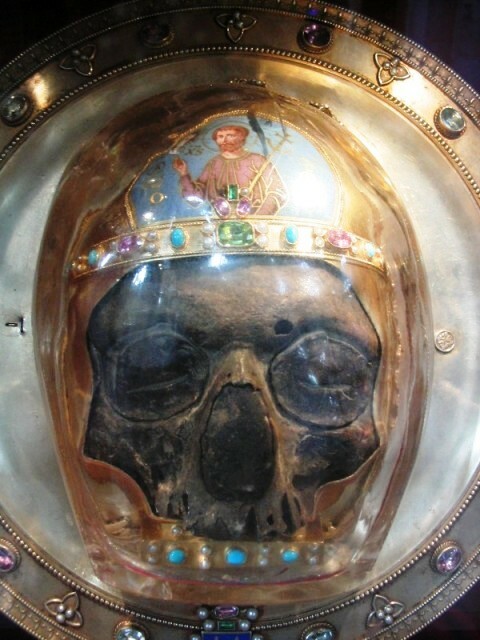 Set in a reliquary in the form of a platter such as Salome carries here, the skull was only partially enclosed, and pilgrims were told that a cleft in the left temple had been made by Herodias’ knife (see this skull below). The chapel of the Baptist had been recently rebuilt by Cardinal Jean La Grange, who was prominent at the court of Charles V, the brother of Jean de Berry, who often visited Amiens . In fact, in the winter of 1407 — when the painting of the Belles Heures was far advanced — he spent a week there. 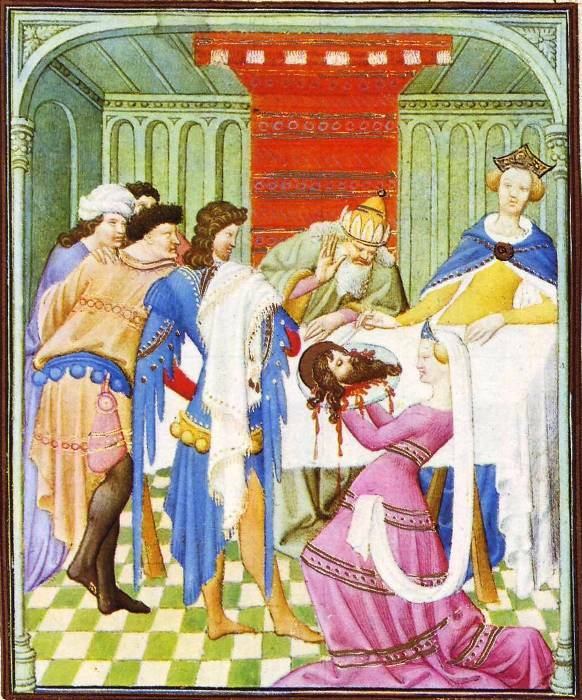 With his devotion to the Baptist and his passion for relics it seems probable that the Duke himself suggested a miniature that would show Herodias enacting her vengeful deed.